Nathan's Real Estate Notions: Urgent Housing Market News! The first quarter of 2009 has come to a close and the low end of the real estate market is on fire! I took a survey of my agents who wrote offers in the past 14 days, and of the last 25 properties they wrote offers on 20 had multiple offers, and of those the average number of offers was 5!!! Below is my previous prediction which I stated back in January. Also, please pay attention to the market stats I have posted!! 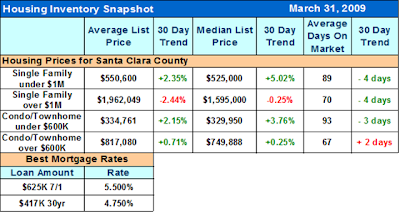 The median home and average home prices across the county have risen! Prices west of 880 are on the way up! Recap: The shift has already begun. The median price for homes below $1M in the county has risen by over 2%, which means more people are buying than selling. Time on the market is shortening, not much, but it is shortening. Below is a chart of sales in all cities East of Highway 880. We have seen 8 consecutive months of demand exceeding supply. For Comparison: Here is the exact same chart for cities West of Highway 880. Current Prediction: The buying trend is going to continue, as long as interest rates stay as low as they do. Properties below 650K are going to see many many more offers and even the ugliest ones will start to get purchased. · Interest rates are at 40 year lows!!! The housing stats I’ve reviewed are showing that some parts of the market will not let prices go any lower. Every time we have multiple offers there are buyers left looking for something else to purchase. Regardless of what the news says, houses are selling, and we might continue to see more demand than supply. Buyers in this market not facing a multiple offer situation can negotiate great deals and if you are purchasing for the long term, now is a great time to purchase when prices are low and interest rates are desirable. For each rise in interest rate by 1% your affordability drops by 10%. Beware of waiting for prices to drop only to be priced out by the rising interest rates. "True luck consists not in holding the best of the cards at the table; luckiest is he who knows just when to rise and go home." Enjoy the rest of your week and if you know of a friend, co-worker or family member who really wants to buy a piece of property and needs some sound advice let me know. You can count on me to provide it.